In Chapter 17, Let Your Husband be the Children's Father, of Laura Doyle's book The Surrendered Wife, she shares that part of surrendering means understanding and accepting that just because your husband has a different style of parenting doesn't mean he's a bad dad. And she's right. In fact, that is why children need both parents, because men and women are created differently, and we raise children very differently. 1. Dads play differently. Dads are more likely to startle children and get them excited, and like to rough-house more than moms. Both of these types of play are beneficial in building a child’s self-confidence and willingness to take risks. 2. Dads communicate differently. Studies show that dads are less indulgent with the nonverbal cues, crying and whining. Fathers tend to challenge younger children to use words more to express themselves, increasing the cognitive abilities of children as young as two. 3. Dads challenge, moms calm. There are exceptions to every rule, but generally speaking, moms react to stress in their children by trying to calm them and ease the stress, while dads may more naturally react by encouraging their kids to overcome the problem, or rise to the occasion. Both are important facets of building confident, capable kids. 5. Dads appreciate moms’ trust.The respect and trust that you show for your husband when you turn over the parenting reins can improve your marriage, as well. Couples who cooperate together learn to value one another and spouses and parents, and have a stronger relationship overall. You are teaching your children what a woman, wife and mother is and does. You are teaching them about marriage, relationships, how husbands and wives interact and what to value. You have the unique opportunity to teach them the power of surrendering in a culture that doesn't understand it. What is your character? Is surrendering to your husband and submission to God becoming an integral part of your character as a woman, wife and mother? The more you surrender to God and your husband, the more you chose to respect your husband with your words, attitude and actions, the more you teach your children to respect their father. 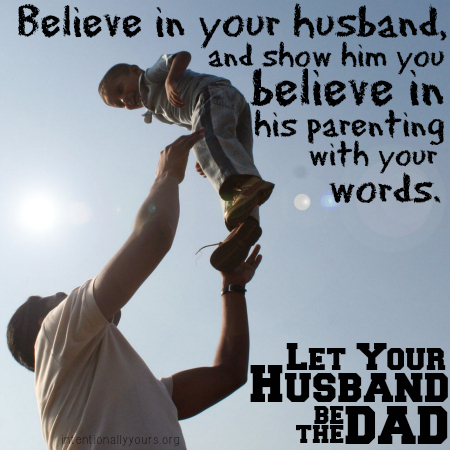 Believe in your husband, and show him you believe in his parenting with your words. Encourage him, praise him in front of the kids, cheer him on. Let him be the superstar and follow his lead, setting him free to be the dad your children need. And protect him- just like you, he is human. He will disappoint. Protect him from the kids in that moment, giving him lots of grace, teaching your children about forgiveness as needed. NOTE: First, it's important to note that a few men are abusive dads...you DO NOT SURRENDER in that case. Getting yourself and your children to a safe place is your first priority. One thing I want to mention here is that yes, I am disappointed that with all God has to say about the role of wives and submission, the author doesn’t cite any scripture, yet manages to quote Buddha. It’s still a great book, it still lines up with God’s Word, the author’s frankness was a practical wake up call for me…I just wish she’d embrace and share that God is the author of surrender. In case you've missed it, this post is part of a series following along with The Surrendered Wife. I'd strongly encourage you to pick up the book and read along! Catch up on the blog series now by reading: Control or Intimacy, Did You Marry a Loser?, Chauffeur or VIP, Shhhh!, Crazy Resentful, Your Heart's Desire, You Bought a What? !, Just Say Thank You, Girlfriends, Button Pusher, Expectations, a Wife's Role, It's Okay to Say I Can't, Naked But Not Ashamed, and If You Can't Say Something Nice.